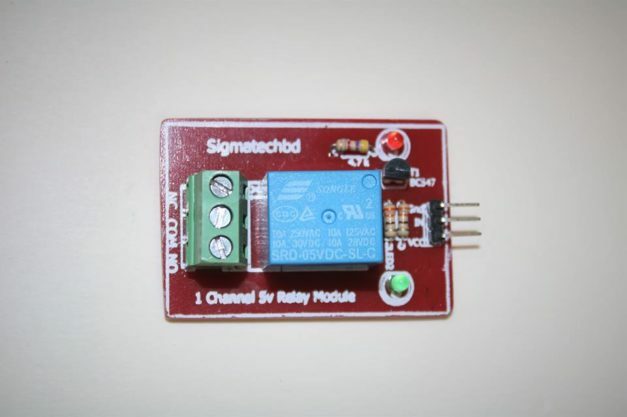 A One Channel 5V Relay Module is an electrically operated device. It has a control system and (also called input circuit or input contactor) and controlled system (also called output circuit or output cont actor). It is frequently used in automatic control circuit. To put it simply, it is an automatic switch to controlling a high-current circuit with a low-current signal. 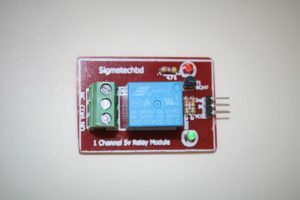 The module uses SRD relay module to control high-votage elecrical devices. (maximum 250V).It can be used in interactive projects and can also be used to control the lighting, electrical and other equipments.It can be controlled directly by a wide range of microcontrollers and can be controlled through the digital IO port, such as solenoid valves, lamps, motors and other high current or high voltage devices. Contact current 10A and 250V AC or 30V DC. • Each channel has indication LED. • Coil voltage 12V per channel. • Input signal 3-5 V for each channel. • Three pins for normally open and closed for each channel.